What is static keyword in C# programming? How to use it with functions and variables? How to use static method or variable in C sharp programming? Whenever you write a function or declare a variable, it doesn’t create an instance in a memory until you create an object of the class. But if you declare any function or variable with a static modifier, it directly creates an instance in a memory and acts globally. The static modifier doesn't reference any object. How to: It is very easy to create static modifier with variables, functions and classes. Just put static keyword before the return data type of method. 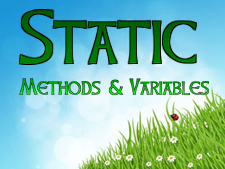 In this chapter you learned in details about static method and variables. You also learned how to use it in program. In next chapter you will learn about Main method in C#.